Okay, at the urging of a few people, I am putting together a series of step by steps. These are to detail as much as I can tell about speed painting. 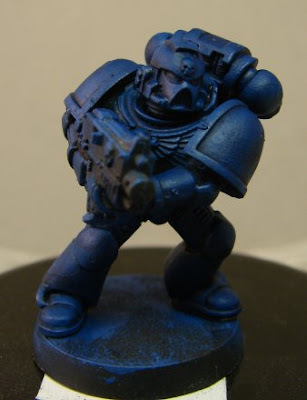 I give you Easy Ultramarines! 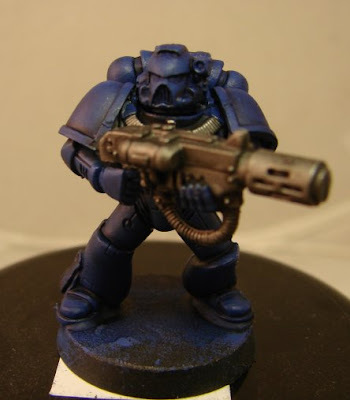 Step 1 - After a Black Primer coat, apply GW Mordian blue to the entire model. Step 2 - Appy a liberal wash of GW Asurman Blue to the entire model, instanly shading the model. 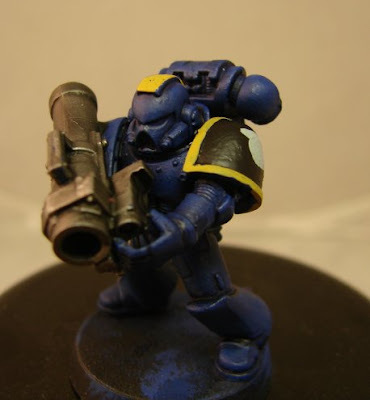 Step 3 - Apply GW Blotgun Metal to weapons, skulls, and venting on the backpacks. After the boltgun dries, apply a quick wash of GW Badab Black. Step 4 - the most aggressive step in the entire process. 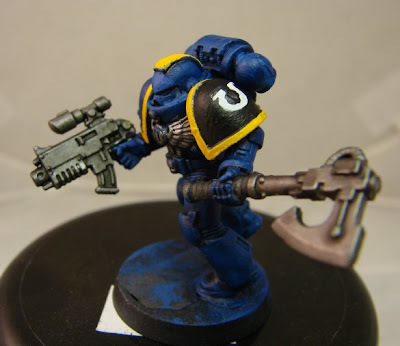 Black out the left shoulder pad with GW Chaos Black, paint a dot and a line across the top in GW Astronomican Grey. 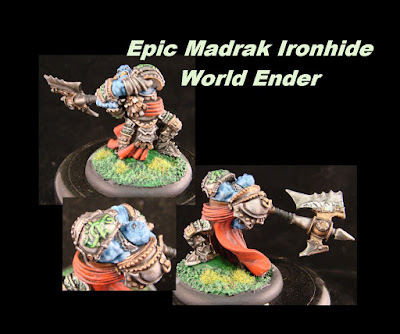 Now Edge the shoulder pad with GW Iyanden Darksun. Step 5 - Paint over the Iyanden Darksun with GW Golden Yellow. Paint over the Dot and the line with GW Skull White. Take GW Chaos Black, paint a smaller black dot within the white dot, closer to the top of the white circle than the bottom. Paint a thick black line, straight up thru the bar crossing the circle, and you have a hand painted ultra marine symbol. 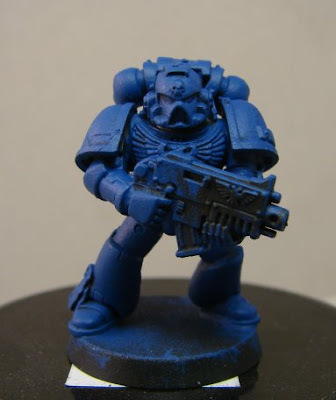 Base, matte varnish, and there you have a very quick easy good looking Ultramarine Squad. No, not a great new exciting model, but my 1.5 year old son. 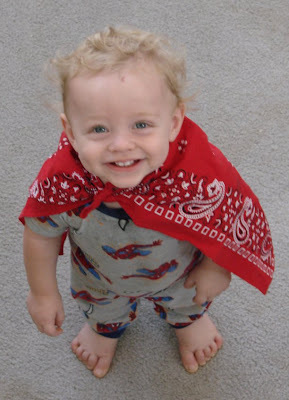 He ran around with a red bandana for a day, so I made him a cape out of it. Well after a great day of gaming at Empire, I decided to swing by Talon's to throw around some ideas for a cross store, valley wide WM/H Tournament. Whilst talking, Ian came in and set up a new contract with me for the week - 3 Chaos Marauder Horsemen regiments and a Chaos Hound regiment. I prepped the first reg of Horsemen by pinning them to square dowels. These models will be mounted to the GF9 magnetic cav bases, but Ian did not have them with him. So instead of taking the chance of gluing them to the bases, only to not be able to get them back off again, I decided to mount them to the dowels for easy painting.